Are we approaching a global warming tipping point? The head of NASA's Goddard Institute for Space Studies, Hansen was one of the first scientists to speak out about the dangers of global warming, at a Senate hearing in 1988. Nearly two decades later he was back in the spotlight when NASA press officials attempted to curb his public comments on the subject. Here, Hansen discusses those incidents and the science of global warming that developed between them. This is an edited transcript of an interview conducted January 10, 2007. ... I want to talk about 1988; it's where you got the name "the father of global warming," whether you like it or not. ... Do you remember that summer in 1988? Yeah, I remember it pretty well. It was a very hot summer. We had a huge drought in the Midwest. Did it raise questions about the weather, that summer? Why were you chosen to come and speak? So in fact, in front of the senators, you were waffling a bit yourself. You didn't say "global warming." No, I said that I was 99 percent confident that the world really was getting warmer and that there was a high degree of probability that it was due to humanmade greenhouse gases. I think it was the "99 percent probability" statement which got a lot of attention, because that was a fairly strong statement. What was the scientific consensus at the time? Was it at 99 percent? No, and I got a lot of reaction to that statement after the fact. There were a couple of scientific meetings [where there] were ... criticisms of my statement as being too strong. ... That's unusual to go past the scientific consensus. Why did you do it? Well, I'm not sure it was really past the consensus. It's past what scientists were willing to say, and that continues to be an issue and one which really needs to be discussed. ... Scientists are cautious, and that's OK. But ... that creates a problem, because we don't have a lot of time to begin to change the technologies and the energy infrastructure so that we can avoid what [are] really dangerous climate changes. But scientists usually aren't the people to decide that. You took a very interesting role, which is different. You kind of said, "Look out! It's coming!," instead of "I'm in my lab, and I see this problem." The first person to have really great insight into this problem, I think, was John Tyndall. He's a physicist, a British physicist in the 1850s and 1860s, and he believed that the changes from glacial periods to interglacial warm periods were probably due to changes in greenhouse gases. He made laboratory measurements to show that carbon dioxide [CO2] did absorb in the infrared [spectrum], and it could cause a change in temperature. So he understood the basic phenomenon, and that was way back 150 years ago. Then the Swedish scientist chemist [Svante] Arrhenius in the 1890s took that one step further and did calculations in which he tried to estimate [how much] the earth would warm up with a doubling of carbon dioxide, and he got the right answer within a factor of two. So he's given a lot of credit for that. Are there science points along the way ... that you can think of, either in your own work or in others', that show that progression, that "We think we're right; we're almost sure we're right; we're really, really sure we're right; now we know we're right." I mean, are there progressions like that? If we look in the 1970s, we and other scientists did calculations that showed that it's not only carbon dioxide, but there are other greenhouse gases changing. ... By the time of our 1981 paper, we could see that the earth was getting warmer, and it was consistent, or at least not inconsistent, with carbon dioxide being the main cause of that. In 1981, when you published that paper, could you make projections? Could you say, "We pretty much know what will happen by 2006, 2016"? Well, we did make calculations which showed by that year 2000, the signal should be beginning to be noticeable, and that basically was right. We now do see that the signal is rising out of the noise. Meaning that anyone can see that something is changing? Well, you can see it if you look at the global average. At a given location, the noise -- "noise" is the natural variability, the fluctuations that occur just because of chaos in the system -- those are locally still larger than the warming. So if you want to see the effect locally, you've got to average over a significant amount of time. So when it's warmer than usual last week, I can't say, "Oh, that was global warming." No, you can't, but if you look at a number of years and you see that happening consistently -- not every year, but at a rate that's consistent with our prediction as to how the probability should be changing -- then you can see an effect, and it is legitimate to blame that on global warming. But it's not until really now, in the first decade of the 21st century, that the changes have become large enough and consistent enough. Now, for 30 years, the earth has been getting warmer at a rate of two-tenths of a degree Celsius per decade, so it's now really out of the noise. Most of the warming that's occurred in the last 150 years has been in the last 30 years, at the same time that most of the increases in greenhouse gases have been occurring. So now the story is much stronger than it was. [When you testified in 1988,] did you sketch out for those senators what the world would be like in 2000 and 2016 and 2030? Could you have done that? Which is droughts and forest fires on the one extreme and heavy rainfall and floods on the other extreme. All we could say was that the likelihood of both extremes would increase as global warming got stronger, because increased heating of the surface causes more evaporation. Therefore, at times and places where it's dry, you'll get more intense dry conditions and drought, but overall you're going to have more evaporation, especially from the oceans, and therefore you're going to have more rainfall. So at the places where you do have rainfall, you will tend to get heavier rainfall and more extreme floods. But now we can actually say more than that, because we see that the increased evaporation in the tropics causes heavier rain in the tropics. At the same time, in the subtropics, you get more intense dry conditions. If you look at the maps of the world, the places that get drier -- especially the Western United States and the Mediterranean region and parts of Africa, the Sahel region [on the southern edge of the Sahara] -- I think that's what is beginning to happen in the Western United States: We see a tendency for drier conditions, more forest fires. And that's the danger, that if we go further down this route, that we will really get mega-drought in the West and have some regional climate problems in addition to global ones. I want to ask you one more 1988 question. I read that you had to submit your testimony to OMB [Office of Management and Budget], and they wanted even back then to shade what you were talking about a little bit. Yeah, that was in 1989 that my testimony was altered by OMB. And I got upset about that and sent a note to Sen. [Al] Gore [D-Tenn.], who was the chairman of those hearings, and asked him to ask me during the hearings about some particular sentences in my testimony, because I wanted to make clear that those were not my words; they had been put there by OMB. And that got some attention. So it wasn't unusual for you to be censored when it came to global warming. Why do you think that your testimony in particular was sensitive in the [Reagan] administration, so much so that OMB would want to shade what you were saying? Well, I think the reason it was sensitive was the fact that it got attention. In 1981 the paper that we wrote in Science -- that predicted that the world would be getting warmer over the 1980s and that by the year 2000 you begin to see loss of sea ice and eventually you have opening of the fabled Northwest Passage -- that article was reported on the front page of The New York Times by Walter Sullivan. As a result, we lost our funding from the Department of Energy, because, in that administration, they simply did not want that sort of attention to this problem, because it has big implications for fossil fuel industry. ... Did this get any better during the Gore-Clinton administration? Did you feel that it was easier to get out scientific information? Sure. Things were different. I've had problems with various administrations, both Democratic and Republican, because I like to describe the science exactly as I see it rather than to fit the policies of a given administration. But certainly during the Clinton-Gore years it was easier to say that global warming was real; I mean, they did not doubt that. They did not succeed in doing much to reduce emissions, but they didn't question the science. ... Did you think the Clinton-Gore administration would move further than Bush I? In 2000, candidate George Bush proposed putting a cap on carbon, something that he had done as the governor of Texas. If he'd kept that pledge, ... if there had been a move toward capping carbon dioxide by a Republican president in 2000, would it have made a difference? Yeah, I think it could have made a big difference. I think that that sort of thing was what we needed in order to get off the business-as-usual course, and that's what we need to do in order to keep additional global warming less than 2 degrees Fahrenheit. But in fact, what we've done is stay on the business-as-usual course, and emissions have continued to go up about 2 percent per year. We're now seven years into the new decade, the new century, and we're [at] about 15 percent higher emissions than in year 2000. That makes it very difficult now to get back onto this alternative scenario, and if we don't make some changes in the next few years, it's going to be impractical to do that. What were your disagreements with the Clinton-Gore administration? But the model wasn't good enough. But the model wasn't good enough, and since then we've met and made up about that, because our bottom line is fairly similar. ... We both agree that the experiment that we're doing with the climate is very dangerous, and we need to slow down the experiment. But it was just a question of how much we could say about specific aspects of the climate system, which I didn't agree on. And he wanted to push you to say more than you were willing to say. Go further even than you were willing. The 1990s is the real appearance of the science skeptics. How much did they come after you? I actually don't like the word "skeptics" for them; I think it's better to call them "contrarians," because skepticism is part of science; all scientists are skeptics. If you're not skeptical as a scientist, you're not going to be very successful. You have to continually ask yourself how well your theories agree with the real world, and you can't fudge that. But what the contrarians are doing is acting not as scientists but as lawyers, so they present only the evidence that seems to favor their case rather than being unbiased. And the people who are picked to be supported by the industries that support the contrarians are usually very articulate, sometimes affable people, and to the public, it's hard for them to say whether a contrarian or another scientist is right, because it sounds like a technical argument among theorists. ... It's very analogous to what happened in the case of tobacco industries, where they would always put up a denier who would question the medical evidence that cigarettes caused lung cancer. That worked for quite a while, and unfortunately it's continuing to work in the case of fossil fuels. The public doesn't yet understand how clear the scientific story is. Sure. I said that, as a private citizen and partly because of my understanding of the climate change issue, I decided to vote for John Kerry, because I thought he would address that issue more seriously than the incumbent was doing. I'm not even a Democrat -- I'm a registered independent -- and I even said that my preference would have been [Sen.] John McCain [R-Ariz.]; if he had been on the ballot, I would have preferred to vote for him, because I think we have a fundamental difficulty in campaign finance, and he's attempted to address that problem as well as global warming. Did you feel like you were under attack? ... Well, I think it's more a case of the science being distorted. The problem is to get the scientific story to be translated into a language that the public and policymakers can understand but still do it in a valid way, and that's where I think we have not done a very good job. I think it's still a problem. In fact, I actually think it's become worse in the sense [that] the gap between what is understood about the problem, from a scientific perspective, and what is known about the problem by the public and by policymakers, that gap has actually increased. And that's partly the fault of we scientists, I think. We're just not very good at communicating. And what is it that you think that the public doesn't understand? Well, I think [they] don't understand that we will need to make fundamental changes, because we're not going to be able to burn all the fossil fuels without creating a different planet. And that means we're going to have to find alternative forms of energy; we're going to put more emphasis on energy efficiency. But also, the things that we need to do actually have many other benefits. One of our failures in communication, I think, is that we present it too often as a gloom-and-doom story, but actually there are many benefits of getting onto a path in which we have less dependence on fossil fuels. But this is also a choice, correct? We have a choice to make. And you outlined one of those choices, which is to change the way that we burn carbon, and to not make that choice presents us with what? Well, that's the difficulty. That's why we need to communicate that we have to make some choices pretty soon, because if we don't, then we are going to create a different planet. It's going to be a situation that's out of our control. You made a speech primarily saying that. ... You talked about a 10-year tipping point. What happened after you made that speech? You're referring to the speech in 2005 at [the] American Geophysical Union. ... I received a pretty prompt reaction. I made this talk available to the media over the Internet, and it was excerpted in the International Herald Tribune, The New York Review of Books. So it got a lot of attention, the discussion about the tipping point, the fact that we're very close to a tipping point. It also had an impact on the public affairs office at NASA headquarters, who began to put restrictions on my ability to communicate with the media. Well, they did it through public affairs officers telling me that I would have to submit any talks prior to giving them and that before I could speak to any media, I would need to get approval on each and every case. And you hadn't submitted the "tipping point" speech to anybody. No, I hadn't. And also our analysis that we put on the Web, we were told that we could no longer do that without obtaining approval from NASA headquarters for each additional thing that we put on the Web. Did they put it in writing? How did they tell you? Well, most of this came orally. There were [teleconferences] between public affairs at NASA headquarters at outer space flight center [Goddard Space Flight Center] in Maryland and in New York City, in which they discussed what restrictions should be applied to me in my discussions with media. And if you didn't comply? Well, there was some things relayed to me that there would be dire consequences. Headquarters told the New York City public affairs person that there would be dire consequences. And were dire consequences filled out? No. I did miss some opportunities to communicate. So, for example, there was a National Public Radio interview that I was to give, and instead public affairs [said] that NASA headquarters would have to give that interview. And would NASA headquarters' science position be different than yours? I assume it would be, but that interview actually never occurred, because NPR decided they didn't want to talk to NASA headquarters. After we were forced to take down our temperature data from the Web site, then I realized I really was going to have a very hard time communicating on this topic. So then I decided to make an issue of it, and I wrote down everything that had happened over the preceding few weeks and sent that to someone at Time Warner. But when they didn't respond to that, then I sent it to [science reporter] Andy Revkin at The New York Times, and he did write an article in The New York Times, which got some attention. Did that change their attitude toward your ability to speak to the media? Yeah. Fortunately the NASA administrator [Michael Griffin] became involved, and he made a very clear statement that NASA scientists should be allowed to say what they believe, and if they say something related to policy, they should identify it as their personal opinion rather than as NASA policy. He was very straightforward about that, and since then I have taken that as a license to say what I believe. Do you know of other government scientists who have been edited or censored? National Oceanographic & Atmospheric Administration. And the way they described [it], they often had to have a listener on the telephone with them -- (chuckles) -- when they spoke with the media. That sounded as bad if not worse than NASA. I mentioned that in a talk that I gave, and also I know that EPA [Environmental Protection Agency] scientists are not free to say what they believe; if it differs from administration policy, then they're not allowed to say that to the media. In your mind, was this a pattern? Do you think that global warming or climate change, whatever you want to call it, has become a political issue? Well, sure. Global warming has become a political issue because it will require very fundamental changes in our energy systems and in our way of life. It will have an impact on industry, and it so happens that industry decided it would prefer to keep things the way they are. I think it certainly is not a gloom-and-doom story in the sense that, what would be the net impact of changing our energy systems and becoming more efficient? For one thing, we can reduce air pollution. For another, the reduction of dependence on foreign sources of energy will be a huge benefit. I mean, right now we're sending huge amounts of money to different parts of the world, and some of that money can get used for things which may be very harmful to us. So if we can develop energy sources that are internal, and we can develop technology which is very energy-efficient or uses renewable energies, we can sell that globally. So it will produce good jobs, high-paying jobs, and be good for our economy in the long run. We really need to get out in front on this. If we are the last ones to admit that we need to make changes, then it's going to be other countries that will have the technology, and we're going to be the poorer for it. But if we do get cracking on this, I see it as really very positive in terms of a cleaner atmosphere and in terms of [a] stronger economy. When you made your "tipping point" speech, was there a scientific paper that prompted you to do it? Was there a piece of science that made you think, "I have to go and warn people"? And so you felt it was your scientific and human duty to speak out? Yeah, because the thing is that what was becoming clear to scientists is just not recognized by the general public, and I think that the scientific story had really become very clear. I don't want to be in a position where a few decades from now, my grandchildren say, "Opa understood what was going to happen, but he never tried to make it clear." So I do think it is the obligation of scientists to try to inform the public what they know. 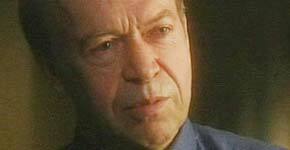 Although there were policymakers who said, "Jim Hansen is an alarmist." Well, I would say that I am sounding an alarm, but I think it's a legitimate alarm. I think we have very good reason for saying what we're saying. Is there a scientific consensus behind the idea that we are close to a tipping point, that we have a finite amount of time to turn this around? I wouldn't say that there's a scientific consensus, because there aren't that many scientists that look at the broad picture of where our climate is now compared to where it was in the earth's history. But the relatively small number of scientists who are involved in this research I think have become very concerned in the last five years, and I think it's very different than it was just 10 years ago. I think that some of the best scientists are really very concerned now, and we just haven't been able to communicate that concern, I think, to the public as well as we should. When you see these pictures on television -- ice floes falling into the sea, polar bears stranded on little pieces of ice -- do you see those pictures differently than the general public sees them? Well, probably we do, because you can't use pictures of ice falling into the sea to prove much of anything, because it's always been true that the glaciers shed ice at their edges and they grow at the center. But what we have now is new data, which is remarkable data; for example, the gravity satellite, which has only been up for three or four years, but it allows us to measure the mass of the Greenland ice sheet and the West Antarctic Ice Sheet. What we find is that it's true that the ice sheets are growing in the middle, but they're losing a lot more at the edges than they are at the middle, and it's not in balance. And it's changing. Even over the timescale of just the last few years, there have been notable changes. It's made a number of glaciologists very concerned that we're getting very close to a tipping point with regard to stability of the ice sheets. And when ice grows in the middle but sheds on the corners, why is that cause for concern? It's cause for concern because there are multiple feedbacks. Once you start disintegration of an ice sheet and get beyond a certain point, it will be impossible to stop it. ... For example, we're now measuring earthquakes on Greenland. There are seismometers located around the world which allow you to pinpoint where and when an earthquake occurs. Well, the number of earthquakes on Greenland doubled between 1993 and 1999, and now it's doubled again. And what these earthquakes are on Greenland are icequakes: A section of the ice sheet surges forward, toward the ocean, and then it grinds to a halt on the solid land underneath the ice sheet. But those surges are increasing because of this increased melt. When you get meltwater on the surface of the ice sheet, it will go through a crevasse all the way to the base of the ice sheet, and there it lubricates the base of the ice sheet and increases these earthquakes, these icequakes. So there are a lot of signs that things are beginning to happen. Glaciologists are getting very worried about this, and I think they should be. You've done something different than many scientists: You have not stuck to the science. You have crossed the line in some ways into talking about policy, talking about what we should do, talking about warnings. This is not a traditional role for a scientist, which is why some people have said you are an alarmist, because you are playing multiple roles. Yeah. Somebody needs to help the public understand what are the implications. For example, NASA had a press conference on their observations on changes in the sea ice in the Arctic. They had a dry run before the press conference, and they used that to warn the scientists not to talk about policy. But can you think of any other scientific-related problem where we would accept scientists to cross that line and recommend policy? No, I'm not recommending policy. In some cases I do. I make statements. Yes you do! You certainly do. The question is, should scientists recommend policy? Well, I don't think scientists should recommend policy, but I think we should make clear the policy implications of our science. And I think it's all right to point out the impact of alternative policies on the particular issue; in this case, the climate. It's now 2007, and there is no policy change. Are we eight years away from a tipping point? Oh, I think we are. No more than eight years away, because at the rate of increase of CO2 emissions -- which has been about 2 percent per year -- by 2015 we will have 35 percent greater emissions than in the year 2000. That will make it very difficult, and probably impractical, to get down to the emission level that we would need in order to keep global warming under 2 degrees Fahrenheit additional warming. Then I think we will have crossed a line where there are going to be substantial climate changes which will be unavoidable. ... Is it now time to prepare for a different planet than the one that we have become used to? We should do logical things to adapt to changing climate, but I don't think that's a practical solution. I still think we have to begin now, begin very soon to take significant actions that would avoid the large climate change. I think we should have a moratorium on any more coal-fired power plants in the United States until we have the ability to capture the CO2 and sequester it. We could very easily live with such a moratorium by simply emphasizing energy efficiency, especially in our buildings. We have the technology now to make buildings that produce 50 percent less carbon dioxide and greenhouse gases than presently they do, but we need to have standards. We need to have regulations that say we should do those things. The building engineers, the architects, they're eager actually to do this, but unless there's some political leadership, that's not going to happen. Texas is dealing with this very problem and in the next couple of months will decide, one way or the other, whether they are going to put coal-fired plants online. If you were in Texas, what would you tell them? This is the most critical issue at the moment -- even more important than automobile efficiencies -- is power plants, because the lifetime of power plants is many decades; can be 50 years or 75 years. We don't want to build this old technology, coal-fired power plants. Coal may very well be used in the future, but it should be with the new technology where you capture the CO2 and sequester it. So we should not allow those to go forward. That's one thing Congress should address very soon, because I think that's one of the most important steps they could take to begin to get us on to a path that is sustainable. Editor's Note: On Feb. 26, 2007, the Texas energy comopany TXU was bought in a $45 billion leveraged buyout -- the largest in American history. The new owners have pledged to put the company on a greener course and to reduce the number of planned coal-fired power plants from 11 to three. Even if Texas doesn't, China puts a coal plant online once a week, and over the next decade they will spend more than $1 trillion in power plants. There is really little we can do to stop that. No, there's a tremendous amount that we can do to stop that, and that's beginning to address the problem ourselves, because they will never address it if we are not doing it. And furthermore, for our own economic well-being, it would be great if we had the technology to deal with this problem, and we could sell it to the rest of the world, because China is going to turn around on this within a decade or so, once it becomes clearer what the implications are. They're going to suffer more than we are from climate change; they have hundreds of millions of people who are living close to sea level, for example. They have every reason to be concerned about climate change, and, especially as they become stronger economically, they'll be able to do that. Now, we would be better off if we had the technology to sell to them, to get back some of our money that they're getting now.